How much computer space is needed to store your full genome? This is an interesting question and one that Dan at Genetic Future explores at length. First, there still seems to be many limitations to the process of sequencing, so for every base and for each chunk that gets sequenced and lined up with the rest, there is a fair degree of uncertainty. According to Dan and his various calculations, this can result in a sequence taking up to several terabytes. According to Wikipedia that's the equivalent of about 1500 novels or 26 hours of MP3 music. Since most of our genome is the same across all individuals, you might just want information about the sites or regions that are known to vary. This would result in even smaller file sizes. There's three studies on skin pigmentation and cancer in the latest Nature Genetics, and a commentary piece (see below) synthesizing the findings. One study is a whole genome association study for skin cancer, finding two SNPs on chromosome 20. Another is a candidate gene study looking at the association of variants in TYR and ASIP on skin cancer risk. Finally, another study finds an association of "new" variants in ASIP and TPCN2 with pigmentation among Icelanders and Dutch individuals. I think that the most interesting, but not necessarily surprising, thing here is how the associations with skin cancer risk differ between populations. Abstract: Pigmentation traits are known risk factors for skin cancer. Now, three new studies provide insights into the genetic factors underlying these effects, and the results reveal a surprisingly complex picture of the relationship between pigmentation traits and disease risk. Daniel F Gudbjartsson, Patrick Sulem et al. Abstract: Fair color increases risk of cutaneous melanoma (CM) and basal cell carcinoma (BCC). Recent genome-wide association studies have identified variants affecting hair, eye and skin pigmentation in Europeans. Here, we assess the effect of these variants on risk of CM and BCC in European populations comprising 2,121 individuals with CM, 2,163 individuals with BCC and over 40,000 controls. A haplotype near ASIP, known to affect a similar spectrum of pigmentation traits as MC1R variants, conferred significant risk of CM (odds ratio (OR) = 1.45, P = 1.2 10-9) and BCC (OR = 1.33, P = 1.2 10-6). The variant in TYR encoding the R402Q amino acid substitution, previously shown to affect eye color and tanning response, conferred risk of CM (OR = 1.21, P = 2.8 10-7) and BCC (OR = 1.14, P = 6.1 10-4). An eye color variant in TYRP1 was associated with risk of CM (OR = 1.15, P = 4.6 10-4). The association of all three variants is robust with respect to adjustment for the effect of pigmentation. Kevin M Brown, et al. Abstract: We conducted a genome-wide association pooling study for cutaneous melanoma and performed validation in samples totaling 2,019 cases and 2,105 controls. Using pooling, we identified a new melanoma risk locus on chromosome 20 (rs910873 and rs1885120), with replication in two further samples (combined P less than 1 10-15). The per allele odds ratio was 1.75 (1.53, 2.01), with evidence for stronger association in early-onset cases. Abstract: We present results from a genome-wide association study for variants associated with human pigmentation characteristics among 5,130 Icelanders, with follow-up analyses in 2,116 Icelanders and 1,214 Dutch individuals. Two coding variants in TPCN2 are associated with hair color, and a variant at the ASIP locus shows strong association with skin sensitivity to sun, freckling and red hair, phenotypic characteristics similar to those affected by well-known mutations in MC1R. The premise of the paper below is to improve on the use of Dn/Ds (the ratio of nonsynonymous to synonymous mutations) as a measure of purifying selection since it has shown mixed results with respect to explaining differences between disease related genes and other genes. They argue that this may be a result of an outdated OMIM database. Here they "hand curate" their own version of the OMIM, using only well defined highly penetrant diseases. genes associated with complex-disease susceptibility tend to be under less-pervasive purifying selection than are other classes of essential or disease genes. ... existing data raise the possibility that, whereas simple disorders are generally well-described by models of purifying selection, complex-disease susceptibility is tied, at least in part, to evolutionary adaptations. Abstract: What evolutionary forces shape genes that contribute to the risk of human disease? Do similar selective pressures act on alleles that underlie simple versus complex disorders [1, 2, 3]? Answers to these questions will shed light onto the origin of human disorders (e.g., ) and help to predict the population frequencies of alleles that contribute to disease risk, with important implications for the efficient design of mapping studies [5, 6, 7]. As a first step toward addressing these questions, we created a hand-curated version of the Mendelian Inheritance in Man database (OMIM). We then examined selective pressures on Mendelian-disease genes, genes that contribute to complex-disease risk, and genes known to be essential in mouse by analyzing patterns of human polymorphism and of divergence between human and rhesus macaque. We found that Mendelian-disease genes appear to be under widespread purifying selection, especially when the disease mutations are dominant (rather than recessive). In contrast, the class of genes that influence complex-disease risk shows little signs of evolutionary conservation, possibly because this category includes targets of both purifying and positive selection. Researchers have been maintaining different inbred lines of fruit flies, They then focus in on behavioral differences between lines to study the genetic correlates (gene expression profiles) of those differences. This is very similar to what could and is being done among domestic dogs - except that the dog lines are not quite as inbred. In this news piece in Science, Elizabeth Pennisi explains how this research started and describes some of the projects. The project began a decade ago. Twice, in 1999 and 2002, Mackay's NCSU collaborator Richard Lyman showed up at Raleigh's farmers' market and picked off the fruit flies that emerged as crates of freshly harvested peaches were opened. 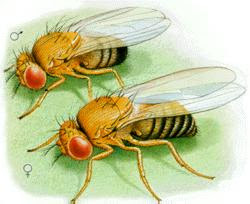 Individual females were placed in vials, and each fly that reproduced became the progenitor of a single line of flies. Their offspring were allowed to mate only with each other, resulting, after several generations, in a line of genetically identical individuals that display consistent behavior. Each line is genetically--and behaviorally--different from all the others. The overall goal is to capture the genetic variation in the North Carolina wild fruit fly population in these wild-derived inbred lines. Two of the studies that they mention look at expression patterns related to sleeping patterns and alcohol sensitivity. The most interesting finding is that short of actually genotyping individuals to get estimates of genetic admixture, it is difficult to accurately predict degree of admixture from self-report questionnaire data. Yaeger R, Avila-Bront A, Abdul K, Nolan PC, Grann VR, Birchette MG, Choudhry S, Burchard EG, Beckman KB, Gorroochurn P, Ziv E, Consedine NS, Joe AK. Abstract Several lines of evidence indicate the existence of genetic factors influencing male homosexuality and bisexuality. In spite of its relatively low frequency, the stable permanence in all human populations of this apparently detrimental trait constitutes a puzzling ‘Darwinian paradox’. Furthermore, several studies have pointed out relevant asymmetries in the distribution of both male homosexuality and of female fecundity in the parental lines of homosexual vs. heterosexual males. A number of hypotheses have attempted to give an evolutionary explanation for the long-standing persistence of this trait, and for its asymmetric distribution in family lines; however a satisfactory understanding of the population genetics of male homosexuality is lacking at present. We perform a systematic mathematical analysis of the propagation and equilibrium of the putative genetic factors for male homosexuality in the population, based on the selection equation for one or two diallelic loci and Bayesian statistics for pedigree investigation. We show that only the two-locus genetic model with at least one locus on the X chromosome, and in which gene expression is sexually antagonistic (increasing female fitness but decreasing male fitness), accounts for all known empirical data. Our results help clarify the basic evolutionary dynamics of male homosexuality, establishing this as a clearly ascertained sexually antagonistic human trait. We here report the results of the first phase of this initiative that has seen research groups from five different African countries with collaborative support from leading experts in Europe and America establish a biobank of blood and DNA from nine ethnic groups from across the African continent. The biobank of anonymous samples has been used to establish baseline frequency distribution of SNPs of genes important in drug metabolism, hence the initiation of a pharmacogenetics database (http://www.aibst.com/biobank.html). We further analyzed the data for possible stratification of the African ethnic groups alone. No distinct differentiation was observed. 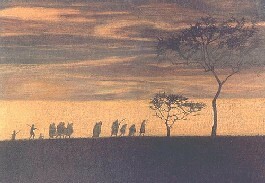 Studies using other genetic markers have demonstrated that there is great genetic diversity among African populations compared to Caucasian or Oriental populations.12 These preliminary findings from our studies could indicate that the number and/or type of genes and/or SNPs analyzed do not carry enough resolution power to capture the genetic diversity of African populations reported in other studies. The high frequency of individuals who are homozygous for the CYP2B6*6 allele (18–25% ) in African populations is predictive of reduced capacity to metabolize and dispose efavirenz compared to Caucasians where lower genotype frequencies of 5–10% have been reported.17, 18 This is in agreement with clinical observations in which Africans have been reported to have significantly higher plasma concentrations of the drug compared to Caucasians when given at the standard 600 mg per day doses.19 Ongoing studies in our laboratory in HIV/AIDS patients taking the anti-HIV drug, efavirenz, indicate the need to lower the dose of this drug in people of African origin homozygous for the CYP2B6*6 allele (Nyakutira et al, unpublished). This could go a long way in reducing adverse effects hence increase treatment compliance. This could also reduce the costs for individuals requiring lower doses and thus partly contributes to the diagnostic costs of identifying such individuals. For the African specific CYP2D6*17 variant20 similar clinical effects could be explored in the use of antipsychotic drugs21, 22 in African populations based on the observed high frequency of the variant (14–34% ) across the major African populations reported in this study (Table 1). Though the current pharmacogenetics database carries no direct phenotype information linked to carriers of the variants, clinical extrapolations from well-established in vivo effects of these polymorphisms give an important baseline that can be the basis for population-specific clinical trial design for optimal use of some medicines. the polymorphism is likely a tissue-specific regulatory mutation, and that it might have been picked up recently from the grey junglefowl. During lay, carotenoids are mobilized and deposited in the yolk of the egg. It is therefore worth speculating that the bright yellow skin color, expressed by well-fed yellow skin homozygotes but not by well-fed white skin birds, has been associated with high production and good health at some point during domestication and was therefore favored by early farmers. Of course, yellow skin may also have been selected purely for cosmetic reasons. Abstract: Yellow skin is an abundant phenotype among domestic chickens and is caused by a recessive allele (W*Y) that allows deposition of yellow carotenoids in the skin. Here we show that yellow skin is caused by one or more cis-acting and tissue-specific regulatory mutation(s) that inhibit expression of BCDO2 (beta-carotene dioxygenase 2) in skin. Our data imply that carotenoids are taken up from the circulation in both genotypes but are degraded by BCDO2 in skin from animals carrying the white skin allele (W*W). Surprisingly, our results demonstrate that yellow skin does not originate from the red junglefowl (Gallus gallus), the presumed sole wild ancestor of the domestic chicken, but most likely from the closely related grey junglefowl (Gallus sonneratii). 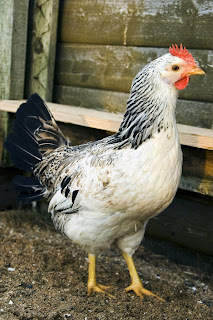 This is the first conclusive evidence for a hybrid origin of the domestic chicken, and it has important implications for our views of the domestication process. Sherpas have a different allele frequency of the ACE I/D polymorphism than non-Sherpas. Adaptation to high altitude in Sherpas: association with the insertion/deletion polymorphism in the Angiotensin-converting enzyme gene. Droma Y, Hanaoka M, Basnyat B, Arjyal A, Neupane P, Pandit A, Sharma D, Ito M, Miwa N, Katsuyama Y, Ota M, Kubo K.
Wilderness Environ Med. 2008 Spring;19(1):22-9. OBJECTIVE: Sherpas are well-known for their physical strength at high altitudes. They adapt to high altitude so well that little acute or chronic mountain sickness has been documented in them. The possible genetic basis for this adaptation is, however, unclear. The objective of this study was to elucidate the genetic background underlying this characteristic among Sherpas with respect to the angiotension-converting enzyme (ACE) gene. METHODS: We enrolled 105 Sherpa volunteers in Namche Bazaar (3440 meters) and 111 non-Sherpa Nepalese volunteers in Kathmandu Valley (1330 meters) in Nepal. Information about high-altitude exposure and physiological phenotypes was obtained via fieldwork investigation. The genotype of the insertion/deletion (I/D) polymorphism in the ACE gene was identified by polymerase chain reaction. Serum ACE activity was also measured. RESULTS: The distribution of the I dominant genotype (II & ID) and the I allelic frequency were significantly more prevalent in Sherpas (II & ID: 94.3%, I allele: 73.3%) than in non-Sherpas (II & ID: 85.6%, P = .035; I allele: 64.0%, P = .036). Moreover, despite residing at high altitude, the circulating ACE levels of Sherpas were statistically similar to those of non-Sherpas at low altitudes (Sherpas: 14.5 +/- 0.4 IU/L/37 degrees C; non-Sherpas: 14.7 +/- 0.4 IU/L/37 degrees C; P = .755). CONCLUSIONS: These findings suggest that the overrepresented I allele of the ACE gene in Sherpas might be one of the fundamental genetic factors responsible for maintaining physiological low-altitude ACE activity at high altitude, which may have an advantageous physiological role in adapting to a high-altitude environment. This paper (abstract below) looks at the association between BMI and the 7R variant of DRD4 often associated with ADHD and novelty seeking behavior (in humans and birds) and inter-racial mating - by same two first authors as this paper. It's also been invoked as a variant that could be selected for in a multilevel (i.e. group selection) density dependent way. I've been very interested in this gene ever since Harpending and Cochran's paper a few years back in PNAS called "In our genes" about what groups in the world have the 7R allele at a high frequency and the link to potential selection benefits - migratory behavior, cad vs. dad male behavior, warfare etc... it's been a while since I've read it. In this paper they find an association between the 7R variant and BMI among the nomadic, but not among the settled group in Kenya. I have yet to read the paper, and would like to see how they attempt to explain this. They don't find a difference in 7R allele frequency between the two groups. Razib also blogged on this paper and put up a map of the worldwide distribution of the 7R DRD4 allele, a table from this paper, and a link to "In our genes". Abstract (provisional) Background Minor alleles of the human dopamine receptor polymorphisms, DRD2/TaqI A and DRD4/48bp, are related to decreased functioning and/or numbers of their respective receptors and have been shown to be correlated with body mass, height and food craving. In addition, the 7R minor allele of the DRD4 gene is at a higher frequency in nomadic compared to sedentary populations. Here we examine polymorphisms in the DRD2 and DRD4 genes with respect to body mass index (BMI) and height among men in two populations of Ariaal pastoralists, one recently settled (n = 87) and the other still nomadic (n = 65). The Ariaal live in northern Kenya, are chronically undernourished and are divided socially among age-sets. Results Frequencies of the DRD4/7R and DRD2/A1 alleles were 19.4% and 28.2%, respectively and did not differ between the nomadic and settled populations. BMI was higher in those with one or two DRD4/7R alleles in the nomadic population, but lower among the settled. Post-hoc analysis suggests that the DRD4 differences in BMI were due primarily to differences in fat free body mass. Height was unrelated to either DRD2/TaqI A or DRD4/48bp genotypes. Conclusions Our results indicate that the DRD4/7R allele may be more advantageous among nomadic than settled Ariaal men. This result suggests that a selective advantage mediated through behaviour may be responsible for the higher frequency of the 7R alleles in nomadic relative to sedentary populations around the world. In contrast to previous work, we did not find an association between DRD2 genotypes and height. Our results support the idea that human phenotypic expression of genotypes should be rigorously evaluated in diverse environments and genetic backgrounds. I'm not so sure why one would expect a different result if you're looking at a set of polymorphisms related to risk to a bunch of different "diseases" (am I the only one getting tired of this term?). Also, I wonder, how exactly did they pick the 25 SNPs? Do the diseases in question differ in prevalence between worldwide populations? They may answer these in the paper, but my cursory reading of the paper did not find answers. Also, I remember someone blogging about this paper a while back, because one of the figures looked very familiar. I thought it was someone at GNXP, but I can't find it... anyone know?? Worldwide population differentiation at disease-associated SNPs. Myles S, Davison D, Barrett J, Stoneking M, Timpson N.
Abstract: BACKGROUND: Recent genome-wide association (GWA) studies have provided compelling evidence of association between genetic variants and common complex diseases. These studies have made use of cases and controls almost exclusively from populations of European ancestry and little is known about the frequency of risk alleles in other populations. The present study addresses the transferability of disease associations across human populations by examining levels of population differentiation at disease-associated single nucleotide polymorphisms (SNPs). METHODS: We genotyped ~1000 individuals from 53 populations worldwide at 25 SNPs which show robust association with 6 complex human diseases (Crohns disease, type 1 diabetes, type 2 diabetes, rheumatoid arthritis, coronary artery disease and obesity). Allele frequency differences between populations for these SNPs were measured using Fst. The Fst values for the disease-associated SNPs were compared to Fst values from 2750 random SNPs typed in the same set of individuals. RESULTS: On average, disease SNPs are not significantly more differentiated between populations than random SNPs in the genome. Risk allele frequencies, however, do show substantial variation across human populations and may contribute to differences in disease prevalence between populations. We demonstrate that, in some cases, risk allele frequency differences are unusually high compared to random SNPs and may be due to the action of local (i.e. geographically-restricted) positive natural selection. Moreover, some risk alleles were absent or fixed in a population, which implies that risk alleles identified in one population do not necessarily account for disease prevalence in all human populations. CONCLUSIONS: Although differences in risk allele frequencies between human populations are not unusually large and are thus likely not due to positive local selection, there is substantial variation in risk allele frequencies between populations which may account for differences in disease prevalence between human populations. 102 Americans (25 of each major ethnicity) were typed and they looked at genes where there were several SNPs that had large frequency differences. A spermatogenesis related gene showed up, like they do in several of the signature of positive selection studies. What's up with that?...no one really talks about it. They also find LYST, involved in immune function and skin color. I wish they had some more detailed information on the ethnicity of the typed individuals. Moreover, from the point of view of identifying the genetic basis of health differences between human subpopulations, it may not be particularly important whether drift or selection is responsible for a given difference. In either case, the relaxation of purifying selection on a given SNP site implies that the allelic differences at this site are not likely to be deleterious. This in turn implies that major health differences between human subpopulations are likely to involve not deleterious genes per se but rather deleterious gene-by-environment interactions. Genomics Available online 16 May 2008. Abstract: Single-nucleotide polymorphism (SNP) arrays have become a popular technology for disease-association studies, but they also have potential for studying the genetic differentiation of human populations. Application of the Affymetrix GeneChip Human Mapping 500K Array Set to a population of 102 individuals representing the major ethnic groups in the United States (African, Asian, European, and Hispanic) revealed patterns of gene diversity and genetic distance that reflected population history. We analyzed allelic frequencies at 388,654 autosomal SNP sites that showed some variation in our study population and 10% or fewer missing values. Despite the small size (23–31 individuals) of each subpopulation, there were no fixed differences at any site between any two subpopulations. As expected from the African origin of modern humans, greater gene diversity was seen in Africans than in either Asians or Europeans, and the genetic distance between the Asian and the European populations was significantly lower than that between either of these two populations and Africans. Principal components analysis applied to a correlation matrix among individuals was able to separate completely the major continental groups of humans (Africans, Asians, and Europeans), while Hispanics overlapped all three of these groups. Genes containing two or more markers with extraordinarily high genetic distance between subpopulations were identified as candidate genes for health differences between subpopulations. The results show that, even with modest sample sizes, genome-wide SNP genotyping technologies have great promise for capturing signatures of gene frequency difference between human subpopulations, with applications in areas as diverse as forensics and the study of ethnic health disparities. Kin selection, even in big groups with low r? The underlying question here is: does kin selection offer a benefit (even small) to cooperation even in large groups such as elephant seal colonies where coefficients of relatedness are likely to be small. The comparison to humans are obvious and interesting since most people dismiss small coefficients of relatedness as insignificant in the case of kin selection operating among human groups... in other words, this paper would suggest that: the degree of relatedness, however small, may still factor into the costs and benefits of cooperative behavior... as opposed to: once you get beyond cousins, there is no effect of kin selection. Abstract: Population substructuring is a fundamental aspect of animal societies. A growing number of theoretical studies recognize that who-meets-whom is not random, but rather determined by spatial relationships or illustrated by social networks. Structural properties of large highly dynamic social systems are notoriously difficult to unravel. Network approaches provide powerful ways to analyse the intricate relationships between social behaviour, dispersal strategies and genetic structure. Applying network analytical tools to a colony of the highly gregarious Galápagos sea lion (Zalophus wollebaeki), we find several genetic clusters that correspond to spatially determined ‘network communities’. Overall relatedness was low, and genetic structure in the network can be interpreted as an emergent property of philopatry and seems not to be primarily driven by targeted interactions among highly related individuals in family groups. Nevertheless, social relationships between directly adjacent individuals in the network were stronger among genetically more similar individuals. Taken together, these results suggest that even small differences in the degree of relatedness can influence behavioural decisions. This raises the fascinating prospect that kin selection may also apply to low levels of relatedness within densely packed animal groups where less obvious co-operative interactions such as increased tolerance and stress reduction are important.